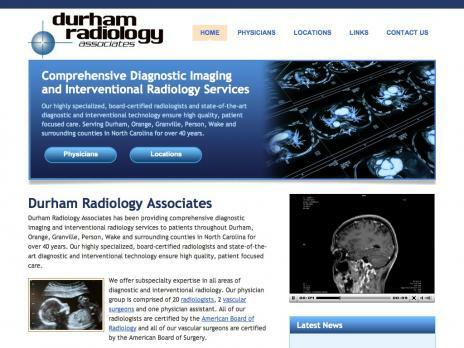 Durham Radiology Associates has been providing comprehensive diagnostic imaging and interventional radiology services to patients throughout Durham, Raleigh, Chapel Hill and Research Triangle Park in North Carolina for over 40 years. This entry was posted on Tuesday, March 17th, 2009 at 3:52 pm	and is filed under Business, Well Designed Websites. You can follow any responses to this entry through the RSS 2.0 feed. Both comments and pings are currently closed.